Over the years, many people have asked me how I maintain my turtle and other aquatic habitats during power outages. The answer to that question has changed over the years as both the frequency and the length of power outages in my area have increased. Nowadays, I use a generator to supply my whole house with power during outages. That's my generator, attached to my house, in the picture on the top of this page. I've also added a shed to store it in since that picture was taken. I bought the generator because power failures used to be rare and short where I live, but in recent years they've become longer and more frequent. We had one last winter that lasted several days, during which my biggest concern was how to keep my turtles and other aquatic pets safe; so I decided to buy a generator. You can read more about how I wired my backup electric generator to my house on this page. Unfortunately, not everyone has the time, money, or outdoor space to install a generator. People who live in cities or in apartment buildings usually don't have back yards, and people who live in rented homes may not be able to get their landlords' permission or may not want to invest the time and money in upgrading a house that they don't own. This page will discuss how to safely maintain your turtle habitat during power outages, as well as some power-backup options for turtle keepers. Before talking about power backup solutions, here are a few tips for minimizing the impact of power failures on your turtles and their habitat. Turtles and other reptiles need warmth to digest their food. Feeding them during an outage will do them more harm than good. Any uneaten food will also accelerate ammonia production in the tank at the same time that the filter isn't running to remove it. Unless you have a way to heat the air in the room to such a warm temperature that it keeps the water in the turtle tank warm (for example by using a kerosene heater or a propane camping heater), wrap the tank with warm blankets to reduce heat loss. "Space blankets" are very convenient for this purpose. Styrofoam panels are also a good option. Even foam poster board will help quite a bit and is very inexpensive. Obviously, you should have these items on hand before a power outage strikes, especially in the winter. such as on a stove, you may be able to keep the tank warm by doing water changes with warm water during the outage. The water you add shouldn't be more than about 20 degrees F (about -7 degrees C) warmer than the tank's normal temperature and should be added in small amounts. I wouldn't exceed 10 percent of the tank's capacity, at most, for any one addition of warm water. Of course, you may have to siphon some water out to make room for the warm water. You can also try placing capped plastic bottles of warmer water (about 40 degrees F (44 degrees C) above the normal water temperature) inside the tank. The heat from inside the bottles will help warm the water around them. Again, you may have to siphon some water out of the tank first to make room for the bottles of warm water. If the power outage occurs during the summer, consider moving your turtles outside. A big plastic bin with the lid halfway across the top will allow your turtles to choose the temperature they like. Placing your turtle in a carrier and placing the carrier in the sun coming through a window may also be a good idea. Make sure to use a thermometer to prevent it from getting too hot inside the carrier. Also keep a sharp eye for predators such as cats, dogs, birds of prey, and other wildlife. As a last resort, you can wrap your turtle in an old tee-shirt or pillowcase, and hold it up against your own body under your clothing. Most turtles don't care for cuddling; but when they're cold, you'd be surprised how well most turtles will tolerate it. Turtles are aquatic reptiles, and reptiles can't produce their own body heat. Living in too-cold water for even a short time can cause turtles to get respiratory infections, which are often fatal. That makes maintaining water temperature the most important part of powering a turtle habitat during a power outage. At an absolute minimum, your backup source will have to generate enough power to run your heaters when they're on. Add up the total wattage of your heater(s) to determine this number. If your turtle tank has more than one heater, turning all except one of them off will reduce the peak power demand of your turtle habitat. However, it won't increase the runtime if using battery backups because that one heater will turn on more frequently than it would if the others were also on; so the total power consumption during the outage will be almost exactly the same. Your habitat's water filtration system is the second most-important device that needs to be powered during a power failure. There are two reasons for this. The first reason is that as long as your filter isn't running, toxins are building up in the tank water. The second reason is that the media inside the filter (especially in closed systems such as canister filters) turns anaerobe and starts producing toxic chemicals pretty quickly when water isn't running through it. Ideally, you should factor your filter's electrical requirements into your power backup solution. If you can't power the filters, then you should unplug them during the outage and discard and replace all of the media if the power outage lasts more than an hour or two. Otherwise, those toxic chemicals will get pumped into the turtle tank when the power is restored. Replacing all the media will mean the tank has to cycle again, which is a big problem with an established tank. You'll have to use something like Tetra SafeStart to minimize stress to your turtles and control ammonia levels during this process. Another option, if you're using battery backups, is to manually unplug the filter during the outage, but plug it back in for about five minutes (for a small filter) to ten minutes (for a large one) every hour. That will help prevent the media from turning anaerobe. But because battery backups consume battery power even when they're not under load, this won't work for more than a few hours at most. Running the basking lights isn't nearly as important as running the heaters and filters during a power failure. Turtles need to bask, and any disruption in the lighting schedule will mess with their circadian rhythms; but they can survive a few hours, or even a few days if necessary, without basking, as long as they have warm-enough water as an alternative place to hang out. Still, if you can, keeping the lights on will make a power outage much more bearable for your turtles. Just be aware that basking lamps run all the time and consume a lot of power; so unless you're using a generator, it's simply not practical to run them during outages. Maintaining UVA and UVB lighting during a power outage is even less important than maintaining the basking lights. Turtles need both UVA and UVB light, but they can survive a power failure even several days long just fine without it. Also, in the summer, you may be able to put your turtles outdoors in a plastic tub with high sides and a half-open lid so they can get natural UV light from the sun. Just watch carefully for predators like cats, dogs, and birds of prey. Unless you also have fish or other water-breathing animals like ghost shrimp in your tank, there is no need to maintain the aeration in a turtle tank during a power failure. Aeration has a lot of benefits in a turtle habitat, but it's not absolutely essential. If you need to save on wattage, and there are no fish in the tank, the air pump should be the first thing that gets unplugged. If you can afford it and have the outdoor space, a generator is the best backup power solution for your turtle tank. Even a small portable generator can provide all the power your turtle habitat needs for as long as you have fuel to power the generator. If you're thinking about using a generator as your power-outage solution, here are your basic options. Whole-house standby generators are permanently installed outside the house by a qualified electrician. They're usually powered by either propane, natural gas, or diesel fuel. When the generator detects a power failure of more than a few seconds, it automatically starts up and assumes the job of providing power to the house through an automatic transfer switch. Likewise, when the power is restored and is stable, the generator transfers the load back to the utility power and shuts itself down. The biggest advantages of whole-house generators are that they are automatic, and that a properly-sized generator and transfer switch can manage all of a home's electrical needs (though not necessarily all at once). The disadvantages are that whole-house stationary generators are very expensive to purchase and install, and that they can't be used for other purposes like portable generators can. In most cases they also require a permit to install, an inspection by your municipality's building department, and possibly an inspection by your power company. As I mentioned above, I installed wiring that enables me to use a portable generator to power my whole house, including my turtle and other aquatic habitats, during power outages. I can't use all the electric devices in the house at the same time, but I can run all the essential things (including all my aquatic habitats) with a little extra wattage to use for non-essentials. 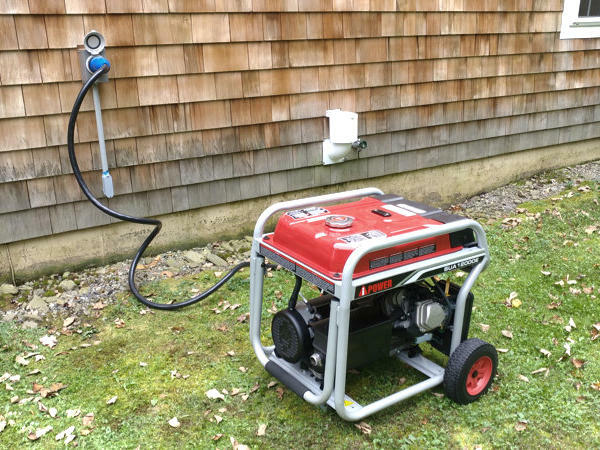 I store the generator in an outdoor storage shed near the inlet box; so when power failures happen, all I have to do is roll the generator out of the shed, connect it to my house with the cord, check the oil and gas, start it up, and flip a safety interlock switch in my basement. Voila. I have power. To wire a portable generator to use as a temporary, whole-house backup power source, you'll need a fairly powerful generator (I chose a 12,000-watt model); a generator inlet box and matching generator cord of the correct capacity (usually 30 or 50 amps); either a transfer switch or a safety interlock made for your breaker panel, depending on your preference and local codes; the correct wire to wire the house (usually 6-gauge NM cable on the inside and 6-gauge THWN to the exterior inlet box for a 50-amp circuit); a circuit breaker of the correct capacity for your circuit and the correct style for your breaker panel to protect the backfeed circuit; and various odds and ends like a junction box and wire nuts of the correct sizes. Unless you're very experienced in house wiring, you'll also need an electrician to put it all together; and just as with permanent generators, you'll need a municipal permit, an inspection by your municipality's building department, and possibly an inspection by your power company, before you can hook your generator up to your house. The advantages of using a portable generator in this way are that it's a much less-expensive solution than a permanently-installed whole-house generator, and that you can also use the generator for other purposes because it's portable. The biggest disadvantage is that it's not automatic. This could be a problem if you're not usually home when power outages happen. In my case, I work at home and am rarely away for more than a few hours, so that wasn't as big an issue. If you want the long run times that generators offer, but either don't want, can't afford, or aren't allowed to wire the generator to your house, you can use a portable generator and extension cords to power your turtle habitat during power failures. Using this method, all you have to do is position the generator outdoors somewhere nearby a door or window through which you can pass the extension cords, and plug your habitat's heater, filter, and optionally the lights and aerator, into the extension cords. If all you want to power is your turtle habitat, you should be able to get away a portable generator in the 2,000 to 4,000-watt range. They're quite inexpensive and should provide plenty of power for even a large habitat. If you want to power other household electrical items in addition to your turtle habitat, then of course you'll need a more powerful generator. The main advantage to using a portable generator that's not wired to the house is that it's by far the least-expensive way to get the benefits of generator backup. Another advantage is that because it's not attached to either the house nor the utility power, it shouldn't require any permit, inspection, or professional installation in most jurisdictions. The disadvantage is that you have to run extension cords into and through your house, which can be a bother any time, but especially so when the weather is bad (which is also when most power outages happen). But if you're willing to accept that inconvenience, then using a portable generator and extension cords is a perfectly acceptable and inexpensive way to power your turtle habitat during power failures. For many years, I used battery backups to power my turtle habitats through power outages. It was only recently, when outages in my area became longer and more frequent, that I bit the bullet and invested in a generator. The biggest advantage of battery backups is simplicity. You plug the battery backup into the wall, plug the heater (and optionally the filter) into the battery-protected outlets, and plug the non-essential items into the non battery-protected outlets. It takes minutes and requires no special skills. The biggest disadvantage of battery backups is that they don't provide very much runtime. For example, if your habitat is a small one that uses a single 300-watt heater, and you use a 1500VA battery backup to power only the heater, you'll get a maximum of 30 minutes runtime on the heater. With a 3000VA battery backup, which would be pretty pricey, you'd have about twice that time, which still wouldn't be very much. By "runtime" I mean the total time that the heater is actually on, not the time it's connected, because heaters come on intermittently. So if the room were very warm, the heater would come on less often, and the battery would last longer. Because the battery backup itself uses power, however, even if the room were warm enough that the heater didn't come on at all, the battery would still be dead in a few hours. If your battery backup has an ON /OFF switch, you can extend the runtime by turning it off for most of the time, and turning it on only when the water temperature in the tanks drops more than about 2 degrees F (about 1 degree C) below the normal water temperature. When I was still using battery backups to protect my turtle tanks, I powered only the heaters -- not the filters, lights, or anything else. If an outage lasted more than an hour or two, I discarded all the media in the filter and replaced it, then used Tetra SafeStart to re-initiate the cycling. If the outage lasted less than an hour or two (as most outages did back then), then I didn't replace the media. Only a very small amount of toxins will build up in a filter in that time. Long story short, if outages in your area usually last less than a few hours before power is restored, then battery backups can be a good way to power the most essential devices in your turtle habitat during brief power failures. By the way, I still use battery backups for the water heaters in my aquatic habitats, even though I now have a generator. If I'm not home when the power goes out, the battery backups will provide at least a little extra time for me to get home and fire up the generator. For many years, power outages where I live were infrequent, and power was almost always quickly restored. They rarely lasted longer than the batteries in the battery backups that I used to power my most-essential electrical devices, including my aquatic habitats. Unfortunately, in recent years, power failures have become both longer and more frequent where I live. During the coldest snap of the winter of 2017-2018, a prolonged outage occurred that lasted several days. My turtle habitats' battery backups lasted only about half an hour under those conditions because the temperature inside the house dropped rapidly without the furnace running. The way I got my turtles and other aquatic pets through the outage was by using a propane-powered camping heater to heat my office (which is where the habitats are) to such a ridiculously high temperature that it kept the water temperatures in the tank from dropping dangerously low. It was an imperfect solution because of the fire risk, but it was better than letting my turtles die. The fact that I have fire extinguishers throughout the house made it a little less dangerous, but it was still not an ideal solution. I also unplugged all the filters and changed the media before plugging them in again after the power was restored. It was quite a bizarre situation: I was roasting in my office, but freezing anywhere else in the house. It also was enough of a hassle to convince me to buy a generator. If that's an option for you, then it's the one I recommend. MyTurtleCam.com is an educational site for hobbyists interested in aquatic turtle care. All information provided is accurate to the best of our knowledge and belief, but is presented for educational and informational purposes only. No information on this site should be considered authoritative with respect to human health or animal health and husbandry. Copyright © 2010 - 2018 RJMWebDesign. All rights reserved. Legal and Privacy Policies. Hosting provided by Turnkey Internet.